Today, with the Internet and mobile devices -- and increasingly, the Internet of Things -- having transformed our lives, applications are everywhere and used by nearly everyone. Your business is driven by them, your customers connect with you through them, and your employees can’t do their jobs without them. Because we rely on them so heavily, applications must be available when we need them, able to respond within a split second to meet our demands, and secure enough to protect our confidential information. To do that, applications need services. Without them, they are like cars without fuel, banks without vaults, and passports without pictures. Services do things like improve availability and performance to ensure that applications are always accessible and performing as users expect. They also help you protect your network, systems, users, devices, and confidential information, and give you the control you need to decide which applications users can access. 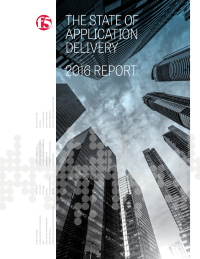 Download this report to learn the number and types of applications and services being used by F5 customers, what their greatest challenges are in delivering them, which services they need more of, and which ones they plan to deploy in the future.